ROMA’s is bookended by camera shots of an overhead flying airplane, the first image seen as a reflection in the water poured on the floor by the maid Cleo (Yalitza Aparicio) and seen again as in the last image in the sky, probably a metaphor that Cleo has risen to a different height in life. The first shot of the plane introduces Cleo as a servant to a wealthy Mexican family. The second time the plane appears is when Cleo an the family are at a beach where she saves the children from drowning, another highlight of her life after being depressed from a failed romance. And the third signals …… . Sorry, no more spoilers in the review. The film is called ROMA because that is the name of the suburb in Mexico City that the film is set. The film follows the life of maid and nanny Cleo as she works for a wealthy Mexican family, loved by the mistress and her children. The daily routines of cleaning, serving, washing are laid out bear amidst Cleo facing life’s ordeals like a failed romance, the breakup of her employers’ marriage and Mexico’s troubles. This is crafted layered storytelling. Cleo works hard. She is jilted and left pregnant by her male chauvinist lover. “One thing is for sure. Women are always alone.” The mistress tells Cleo at one point in the film, which is the theme of the film. Surprisingly, this message is also so relevant in the current age of female abuse. Women have to stand together as depicted in the story of the film. The film has three outstanding segments – a riot protest gone violent, as seen from a window; a drowning scene and a forest fire all done old fashioned no gimmicks style. Cuaron flexes his artistic muscles with a man singing during the forest fire segment. Cuaron also brings the audience up to date to the problems faced by the Mexicans like land rights and violent protests, use of firearm and class distinction. But the most moving segment (and indeed most moving segment found in ay film this year) is the Cleo’s delivery scene, again the details of which will not be spoilt out in this review. ROMA is director Cuaron’s film of his childhood memories with his maid. Directors always make their bet films based on childhood memories – examples being Ingmar Bergman’s FANNY AND ALEXANDER and Federico Fellini’s AMARCORD. ROMA can be added to the esteemed list. ROMA is shot in black and white 16mm and a gorgeous looking picture. 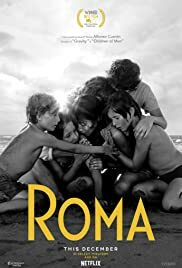 I have seen ROMA twice and the film passes the test of still being captivating on its second viewing. 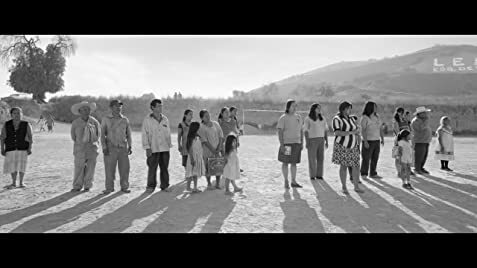 ROMA is Netflix’s hope of winning its first Academy Award in the category of Best Foreign Language Film. It has my vote.